It's September. 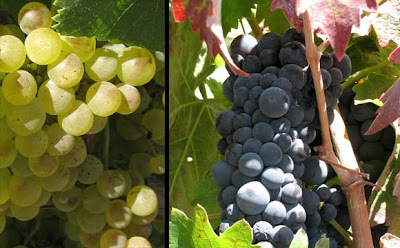 The leaves are starting to get the first bits of fall color and the grapes I pass on the way to work are deep, deep purple and golden green since they are just about ready to be picked and turned into wine. Even though the temperatures have been pretty warm...right around 100 degrees today, fall always makes me want to bake, so today I baked bread and some cookies. I'll post on the cookies another day. When I saw that the Bread Baking Babes, the dozen of intrepid bread bakers who bake quite interesting bread, were making Black Bread this time, I had to try it. Some of them referred to it as Dump Bread, probably because there are some peculiar ingredients, including toasted bread. I used some leftover sourdough baguette for the toast. Sweetie was also surprised to see me add ground coffee to the soaker. If you look at the first rise, you can see some small chunks of the toasted bread that have still maintained their own shape, but no coffee grounds. Since the soaker sat about an hour longer than specified in the recipe, I decided that having bits of the toast still in the dough must be how it is supposed to be and just kept going. This is sticky dough my friends. The bench scraper got a real workout as I kneaded in the last of the flour on the board. The stand mixer just wasn't doing the job. It was still sticky when I shaped it into loaves, which probably explains why only one of the two is well formed...the other one kept sticking to my hands when I tried to create a nice skin. 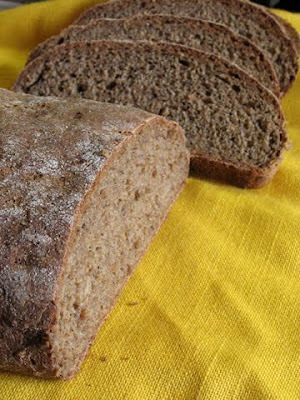 There is plenty of flavor and a nice texture in this rye bread. I call it rye because, including the flour used for the board, it took almost a whole pound of rye flour. It is great toasted and will probably make awesome sandwiches for lunch tomorrow. 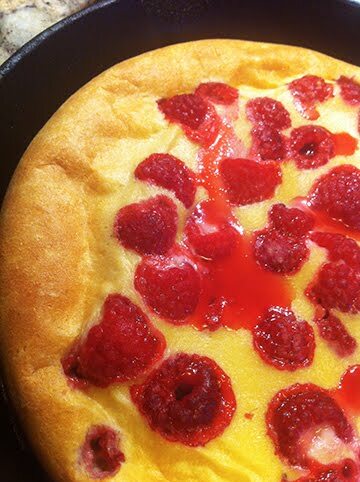 If you want to be a Buddy, too, go to Gorel's blog for the recipe (or look below). Bake the Black Bread before September 7th, blog about it, and send a link to Gorel, and she'll give you a lovely Baking Buddy badge for your website plus you can then really relate to the experiences of the Bread Baking Babes...links for their websites can be found at Gorel's Grain Doe blog too. 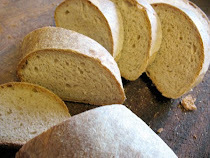 It was interesting to find that Gorel combined two very different recipes to create this delicious bread. I'm also entering this in the Yeastspotting event for this weekover at Susan's Wild Yeast. Each week there are wonderful yeasted breads, rolls and more to be inspired by. * If you don’t have any active starter at hand, you can cheat by using a small amount (say 5 g fresh or 0.5 tsp instant dry yeast) instead. 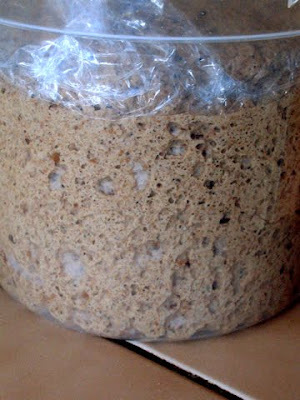 Mix the ingredients to the sourdough, cover the container with plastic and leave for 12–14 hours at room temperature. Toast the old bread in a toaster or in the oven. The bread should be browned, but absolutely not blackened. Dice the bread or just tear it in pieces and put it in a bowl. Add the rest of the soaker ingredients except the water. Heat the water to near boiling and pour over the soaker ingredients. Cover and leave for the same duration as the sourdough. Mix the two flours in a separate bowl. If using fresh yeast: Take a small amount of the soaker liquid and dissolve the yeast in it. Add the yeast mixture OR the instant dry yeast, soaker, sourdough and salt to a mixing bowl. Add half of the flour mixture and work the dough by hand or in machine. Continue to add about 100 ml or ½ cup of the flour mixture at a time and work until the flour is completely absorbed before you add the next round. The dough shall be firm but still quite sticky. You might not use all the flour, or you might need to add more flour, all depending on the flour used. Place the dough in an oiled container, cover with plastic and leave for 2–3 hours or until doubled in size. Drizzle some rye flour on the table top and place the dough on top. If the dough is very sticky, pour just enough rye flour on top of it to make it possible to handle. Divide the dough in two and shape the parts into oblong loaves. (I placed them on parchment paper to make it possible to just slide the loaves into the oven.) Stretch the surface using both hands to get a tight loaf. Use more rye if the dough is too sticky to handle. Place an empty metal container in the bottom of the oven. Put in your baking stone or an empty baking sheet. Heat the oven to 225 °C/435 °F. Put 3–4 ice cubes in the metal container. Move the loaves to the hot stone or sheet. Bake for 10 minutes. Open the oven door to vent out some moist. At the same time, lower the temp. to 200 °C/400 °F. Bake another 30-40 minutes or until they sound hollow when tapped underneath, or when the inner temperature has reached appr. 97 °C/207 °F. Let the loaves cool down before you slice them. Lovely loaves you've got there, I like the shape. I'm happy that you liked the bread -- not all who baked it did! 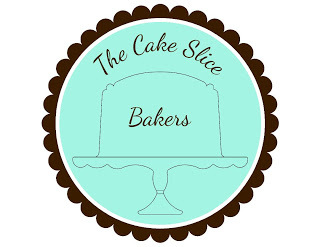 Thanks for baking with us -- A badge is on its way. WoW! That is one great looking loaf up there! Love it that the crumb looks so dark and even. 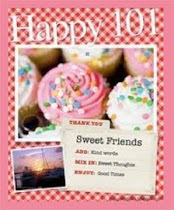 Thanks for baking with us! 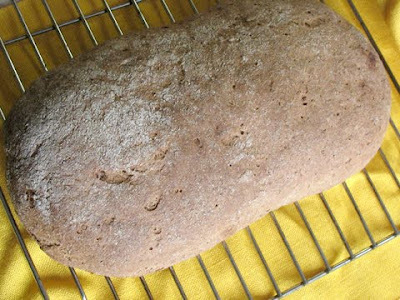 Really good rye bread seems amazingly tricky to make, and it's always astounding at how much rye flour a soft dough really will take. This looks like you've carried it off -- not too dense or heavy, nice, even bubbles all the way through. It's pretty, and I hope it's really tasty! Elle, the bread looks wonderful. I need to get back to bread making, soon. My fingers are itchy! Yeah, buddy! Good job on the bread - it looks wonderful. This was a sticky sucker, wasn't it? But surprisingly good. Hey, they look great! I agree, this was a sticky dough, but the results were worth it. I still have a loaf in the freezer, that I plan on having with some smoked salmon. Well done on this bread. Great looking loaf! I always admire those that bake their own bread and I admire those even more where the bread turns out looking so professional! Gorel, Thanks for the badge and the great bread recipe! Baking Soda, You gals are fun to bake with! Tanita, It's true, but rye bread has such wonderful flavor that it is worth fighting with the dough a bit. Anh, Bread baking is very satisfying. Do try it! Madam Chow, Smoked salmon would be great with thin slices of this black bread. Mmmm. Andreas, Love what you did with your bread! 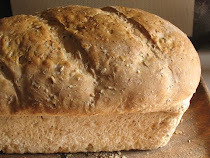 Dharm, You might want to try it...your kids will love fresh bread and it makes your home smell wonderful! That's a truly interesting recipe! I can imagine that it's quite tasty! Thanks! 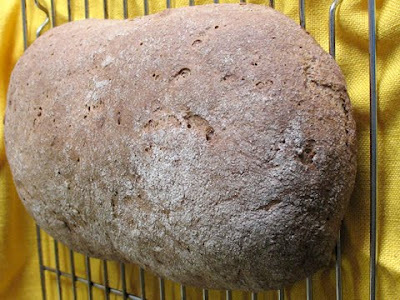 I've enjoyed seeing everyone's black breads and yours looks wonderful. To be honest, putting ground coffee in dough seems a little strange to me, but who can argue with such great results?